Printrbot PLUS V2 Top Stiffener Bracket for M8 hardware by VintageTimeAustralia is licensed under the Creative Commons - Public Domain Dedication license. This dead simple and nifty bracket slips on (very firmly, may need some fettling) the top of the 2 x 12mm smooth rods on the Printrbot PLUS V2. 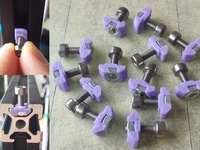 It's designned to take a length of M8 threaded rod and M8 nylock nuts in the recesses. 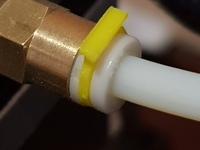 You then want to use a plain or nylock nut on the other side so you can adjust the amount of "push" the brackets give on the smooth rods. 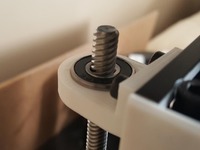 The additional hole up the top you can drill out and use as a filament guide or bolt something else into it. I found the distance between the smooth rods between the bottom and top differed by about 5mm on the Printrbot PLUS stock. This caused the X rods to shift as it went up the axis. 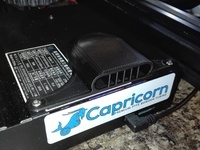 This bracket allows you to adjust this so you can get both smooth rods dead straight. I found adding a stiffener at the top of this machine was quite helpful in improving print quality in general.